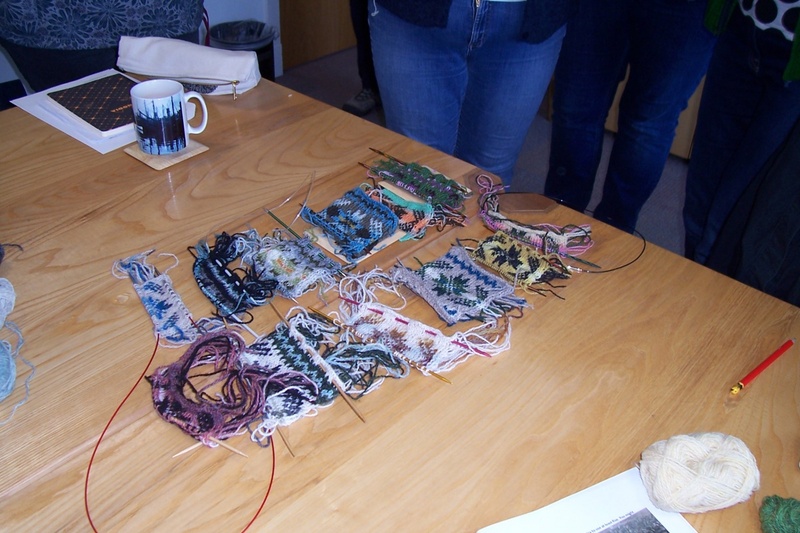 One of the main purposes of Shetland Wool Week is to provide classes – knitting, spinning, weaving. Knitting in particular, is part of the life blood of Shetland. 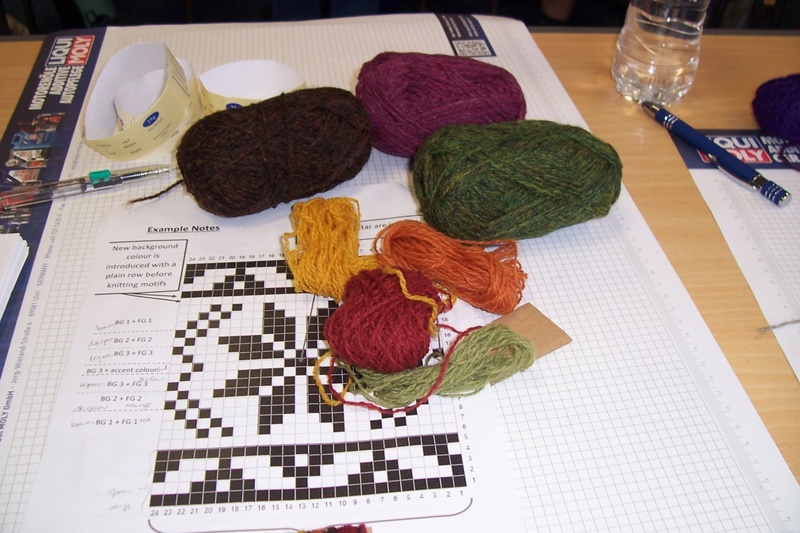 Most of the women of Shetland are experts in both Fair Isle and lace. Classes are in high demand and it’s a matter of luck if you get the classes you want. I was interested in how to choose colors for a project. Up to this time, I had only used the designated colors for the hats I had knitted. 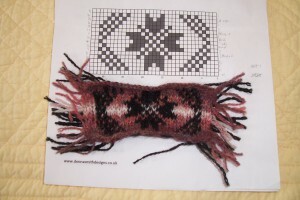 I was fortunate to get two classes on color, one with Terri Malcolmson, ( http://www.terrilaura.co.uk) and the other with Donna Smith, ( http://www.donnasmithdesigns.co.uk) We learned how to choose patterns and borders and how to select colors. It was fascinating to see how to make the center of a pattern ‘glow’ or ‘pop’ using accent colors. I always have to work hard not to choose my favorite colors in exercises like this! Wrapping the colors round the small strip of cardboard was very helpful in seeing how they worked together. It is still necessary to knit a swatch to make sure the colors work well when knitted. 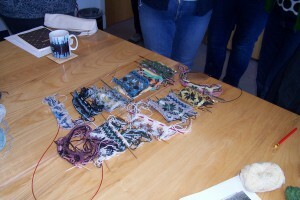 Donna’s class offered further hints and tips on finding colors for your project. One idea that I found useful was to put the yarn into groups of light and dark and then take a black and white photograph to assess color values. In Fair Isle knitting, the patterns have a center horizontally. with the colors shading towards and then away from the center. I was pleased with my final color choices and thought they worked well in the swatch. It was interesting to see what colors other class members had chosen. 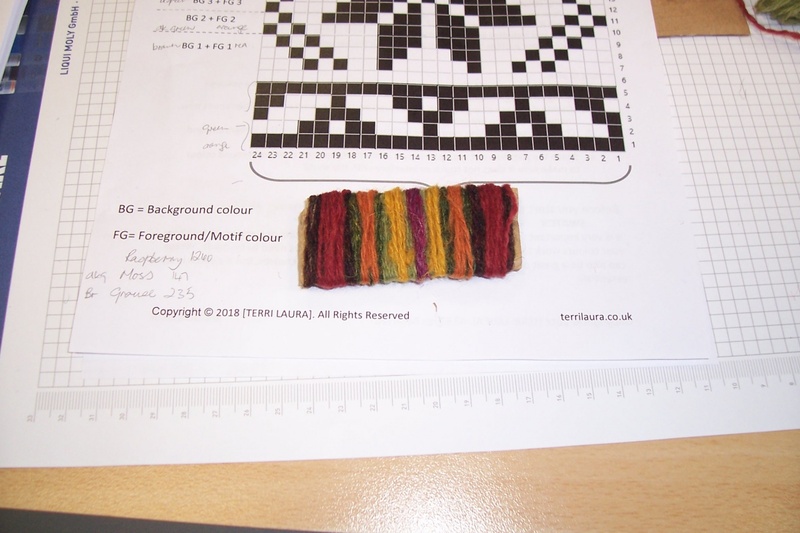 The color classes also gave some insight into how the pattern designers choose their colors. In Shetland there are so many beautiful colors in the landscape. With changing light during the day there’s an infinite number of color combinations which Jamieson and Smith and Jamieson’s, the two main yarn producers try to capture in their yarns.